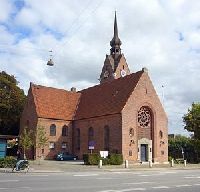 Like Valby, Vanloese was integrated into the municipality of Copenhagen in 1901. Most of the buildings date from 1930-1940 and they are a mixture of villas and flats. There are plenty of parks and green areas, such as Damhusengen, Grndalsparken and Bellahj. Vanloese is well connected to the rest of the city, with an underground line running to the centre and more public transport services on the way. There are no attractions in Vanloese, but the area offers a quiet life not far from the centre.